We all know that eating healthy, real foods is important. As moms, we also know that this is easier said than done. It can be challenging to find healthy meals to cook each day and even more frustrating when children can be really picky about their food. I have been making meal plans the “old fashioned” way for years; finding recipes, testing them, writing them on the calendar, and making a separate grocery list. This method has worked just fine but it is time-consuming (especially for those new to meal planning) and requires a lot of thinking—definitely not automated! Since my blog has been growing, I’ve been asked to provide meal plans, which led me to wonder, How do I do this? 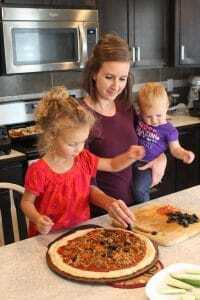 How can I tailor meal plans to the needs of each family? And so I began my trial of Real Plans with YOU in mind; little did I know I was about to fall in love with it for our own family. Weekly meal plan done in 10 minutes? Yes. Real food meals? Yes. Don’t like something on the menu? No worries, you can customize with a drag and drop feature in about three seconds. Have allergies or foods your family won’t eat? Just add them to the settings page and you’ll never see recipes with those ingredients again! You can also customize how many people you are cooking for. 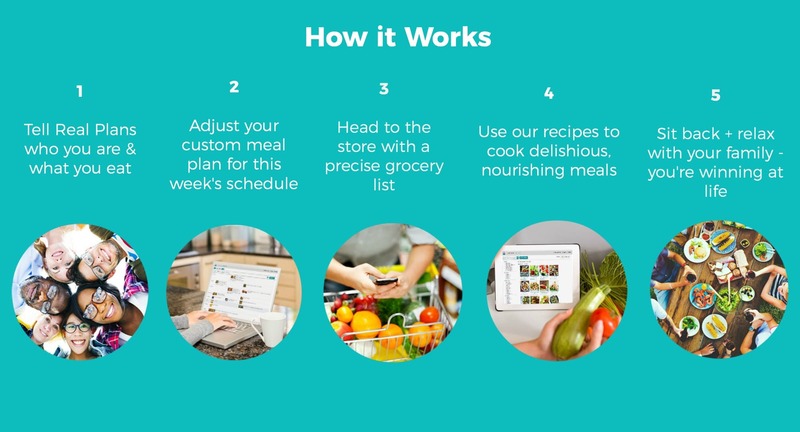 You can even customize which days you would like to generate meal plans, what type of meals, and even if you want a big cooking day so you can batch-prepare meals ahead of time. If you have family favorite recipes, you can add those and make them part of your meal plan or import them from another website! And, Real Plans generates a custom shopping list that you can view on your phone via their mobile app while you shop. You can even check off items you already know you have so you only buy exactly what you need. On top of that, you can modify each recipe, define what store you want to purchase each ingredient at, and even add a photo of the specific ingredient (in case you send your husband to the store to pick up ingredients and he doesn’t know which brand to get). 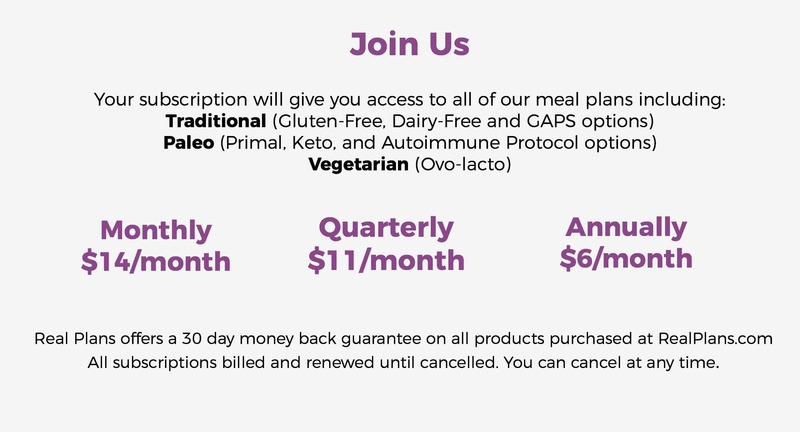 Real Plans is an incredible value and costs as little as $6/month for 800+ recipes (just imagine how much you will save by staying on budget) and don’t forget: you can import your favorite recipes & add additional recipes from your favorite bloggers (it’s like the best virtual cookbook ever!). *Prices above were quoted on 9/20/2017 & are subject to change without notice. -Create a customized meal plan with recipe sizes adjusted to your family size. -Print a corresponding shopping list with the amounts of each ingredient you need in seconds. -You can even add your desired snack, side and dessert recipes so you have all the ingredients you need without wasting anything. -Generate meal plans as often as you want, any time you want so you can meal plan and shop when it is convenient for you. If you are really motivated, you could even pre-plan a month’s worth of meals and pre-cook them! I truly believe Real Plans can help you and your family eat the way you’ve been wanting (and trying) to eat on a regular basis. This system can help you serve consistently healthy, tasty meals. We couldn’t agree more. But we also know that this meal plan is going to help you decrease trips to the grocery store and minimize waste which will decrease your costs each month. This incredible meal planner is available for as little as $6/month! We know this program will save you both time and money and pay for itself each month, just like it has for us & so many others. You’ll get all the tools you need to provide healthy meals your family will actually enjoy. Plus, there is a 30 day money back guarantee. You have everything to gain and nothing to loose by giving it a try.